An agile and light chassis was designed to perfectly suit the lively and powerful little 2-stroke engine. Lightning fast throttle response, class-leading brakes and a smooth and precise gearbox are just a few of the TE 125’s defining characteristics. High performance combined with extreme entertainment, it brings back the child in every man, and is also the perfect tool for future champions to start their career with. From being the newcomers in 2013, to consistently featuring at the top of race results and on magazine covers around the world, the spotlight is most certainly on Husqvarna to deliver class-leading performance and technology. Last year a completely new generation of Motocross bikes was launched to an enthusiastic world audience. Now for MY15, significant updates further develop the premium characteristics of the highly technological Husqvarna Motocross range. From the lightweight and agile handling of the 2-strokes to the explosive power and all-round ability of the 4-strokes, every rider is sure to find a match in the MY15 Husqvarna Motocross range. The lightweight polyamide rear subframe has been reinforced with an additional screw on the airbox side that improves the fitment between the left subframe arm and the airbox. The improved seal guarantees better performance and durability. Handguards are standard across the range and now feature better impact resistance thanks to a new compound. wheels are complemented by new Dunlop MX52 Motocross tyres that feature The lightweight a new “block-within-a-block” design for more progressive cornering. The new Dunlop rubber has been developed to offer superior grip in a wider variety of terrain. 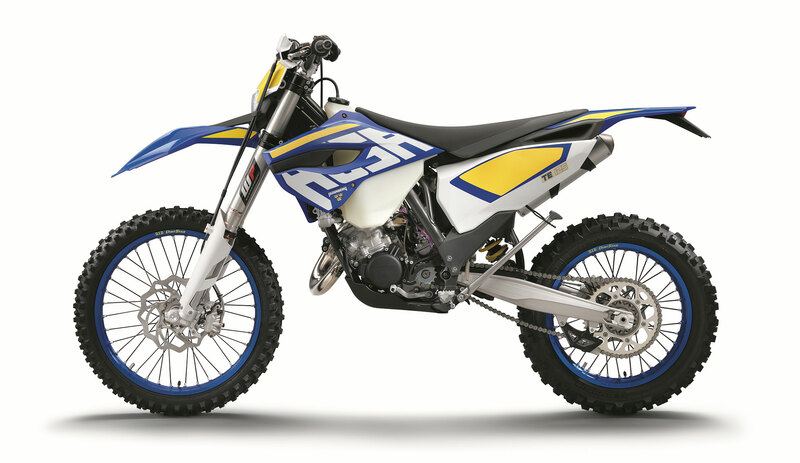 The traditional Husqvarna white, blue and yellow has evolved into a striking and distinctive look for the MY15 Motocross range. The general optimization of the MY15 Motocross range results in an overall weight saving of 338 g.
The high performance 125cc 2-stroke engine on the TE 125 features a sophisticated power valve that optimises power delivery from low in the rev range up to the rev limit. Boyesen reeds, combined with high-tech intake reed blocks, guarantee excellent response, durability and intake flow rates. The high performance cylinder and power valve have been optimised for maximum throttle opening resulting in strong bottom-end torque and excellent top performance. The hydraulic Magura clutch guarantees excellent modulation and clutch action, while the flex lever reduces the risk of breakage by rotating almost 90° in the event of a crash. The ratios of the lightweight 6-speed gearbox have been optimised for Enduro use. The precise shifting action allows riders to accurately maintain the TE 125 in the ideal power range of the engine. a smoother power delivery has been achieved thanks to a revised carburettor setting. The high performance cylinder and power valve are designed to deliver strong bottom-end torque and high peak power at maximum throttle opening. The Vertex piston’s material and piston rings have been designed for power and reliability. Excellent clutch modulation, low maintenance and consistent behaviour are guaranteed by the hydraulic Magura clutch. The clutch lever reduces the risk of breakage by rotating almost 90° in the event of a crash.